Last Updated: August 15, 2012 | Subscribe to our weekly newsletter! Over the years, I’ve come across some interesting money saving tips for your pool while working with pool owners. These tips will help you cut back spending while actively trying to maintain a healthy, stress-free lifestyle, enjoying your pool. The number one reason pool owners replace their vacuum head is because the brushes on the bottom of it have either flattened out or completely fallen off. Store your vacuum head upside down and out of the sun. Over the winter, be sure you keep it away from any chlorine. If you do this, you will double the life of your vacuum head, which can be expensive to replace. Solar covers maintain the heat in the pool, they keep debris out, and they help attract heat from the sun. If you ONLY use a solar cover at night, it helps to keep the heat from escaping your pool – especially on those cool summer nights. If you have a heater, you can crank the heater up to the desired temperature, shut it off, then keep a solar cover on at night. It’ll make the heat from your pool heater last longer. Bonus: If you don’t feel like taking a solar cover on and off your swimming pool every night, then you can invest in liquid solar blankets. They are easier to use and cost much less in the short term. 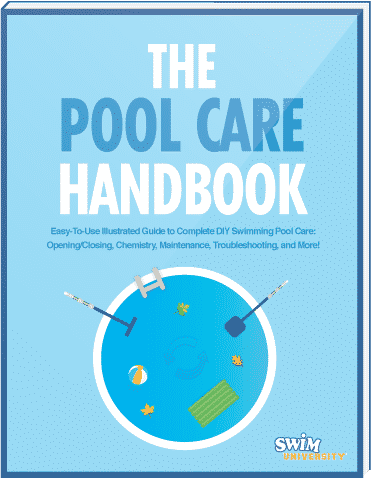 Baking soda will increase your pool’s alkalinity levels. However, is it really cheaper? That would depend on what type of baking soda you’re buying and what type of alkalinity you are buying. I would only use baking soda if you needed to bump up the alkalinity just a little. Baking soda is also more “powdery” than your standard Alkalinity Increaser. This may cause your pool to be cloudy. Just small amounts to avoid cloudiness. Check the prices of the pool store alkalinity increaser vs. boxes of baking soda at the grocery store. You might find that buying it at the pool store is cheaper. It can cost you up to $250 to close down an above ground pool! Of course, that depends on how big your pool is. The best thing you can do is learn how to close down your above ground pool yourself. That’s it! It’s very simple and doesn’t require any special technique. Most pools, when opened in the spring, look like the black lagoon. This will cause some folks to dump a ton of chemicals in the water just to clear it. NOTE: Inground pools with mesh safety covers do not have to worry about this. Their covers are always clean. Throughout the winter, make sure you use a pool cover pump and get the water off the top of your cover. Every time it rains or the snow has melted, tend to your pool and get that water off the cover. When the cover is dry, use a broom and get as many leaves and debris off the top of your cover as you can. Come spring time you will thank yourself for keeping a clean cover. It will be much easier to remove and you’ll be able to re-use your cover for the next winter. No one wants to buy a new pool cover every single year. It can get very expensive. During the hottest part of the summer, I always recommend owners run their pools for 10 to 12 hours a day. You need to keep that water clean and moving so that you don’t run into any problems, such as an algae growth. Algae loves warm water. When the water is colder, it’s harder for algae to grow. This is a good reason why you are able to get away with running your filter less when we have milder (cooler) weather. So you can either cut back that pump to only running 6 hours a day, or invest in a variable-speed pump that uses less energy. Your smaller pool stores generally run spring start-up specials to entice people to get in the door early to get a jump-start on the season. It’s a good move, especially if stores have some leftover chemicals from last year that they are trying to get rid of to make room for the new shipment of chemicals. Also, make sure you buy your pool chemicals in bulk at the beginning of the season whether it’s on sale or not. Stock up on chlorine (or whichever sanitizer you use) and shock since you’ll be using these chemicals all summer. The peak hours for most electric companies are from 7:00am to 7:00pm during the week. This is when it costs the most money to use electricity. To save some green, run your filter during the off peak hours. Let’s say it’s the middle of the summer and you’ve been good at shocking your pool every week. Your pool has been crystal clear all summer long. You’ve been testing your water regularly and everything is going perfectly! Then, you decide that you’ve been so good that you’ll skip a week taking care of it. Remember, now it’s hot and your kids have been swimming in it. All of the sudden your pool turns green and/or cloudy. Now instead of following your normal routine and shocking it once a week, you are forced to triple shock it this week to get rid of the green. And you also have to run your filter system 24/7 to help clear up the cloudy water. Now you have just wasted all that extra money pumping more shock into your water and running the filter longer. In short, shocking your pool every week helps maintain a healthy and clear pool, which will prevent these kinds of things from happening. Robotic pool cleaners are self-contained units that run off of electricity and can clean an entire swimming pool faster than YOU. They drive around the pool on their own, climbing up walls and stairs and collecting all kinds of debris in their fine mesh filter bags. These filter bags also filter the water, so by running your robotic cleaner while the filter and pump ARE NOT running, you are actually saving money while keeping your pool clean. It costs much less to run a small pool cleaner than it does to run your filter system. For those of you who don’t know, chlorine stabilizer or cyanuric acid is a chemical that protects the sun from eating up the chlorine you put in your pool. When you add chlorine to your pool via shock or chlorine tablets, the chlorine is un-stabilized (for the most part). Meaning, it doesn’t last very long in the water to fight bacteria and other harmful contaminates. By adding Chlorine Stabilizer to your water, it will help keep that chlorine in your water longer to fight what it needs to kill to keep your water sanitized. Chlorine is quickly oxidized by the sun and the stabilizer helps protect the chlorine from being oxidized quickly. Water isn’t free, nor is there an infinite supply of it in the world, especially as droughts have become increasingly common and severe in recent years. While most pool owners live in places where a simple turn of the tap releases a seemingly limitless flow of the wet stuff, the fact of the matter is that water is worth conserving- and so is money. While the water wasted at any given moment may be small and seemingly insignificant, it all adds up. It adds up to thousands of wasted gallons, which can translate to hundreds of wasted dollars. Evaporation is the silent, invisible water-waster that plagues every pool owner, but more so in some areas of the nation than others. An uncovered 18’ by 36’ pool loses about an inch of water a week, or 7,000 gallons annually. In particularly hot and dry places like Arizona, an average pool can lose up to 25,000 gallons- all from evaporation. Those numbers are nothing to sneeze at. To fight evaporation, make sure your pool is covered when not in use. A simple solar cover between swims is all that’s needed to save precious gallons. A liquid solar cover in the Spring and Fall are also excellent measures. If you use a pool heater, keep it as low as possible. Lastly, any wind-blocking objects that can be erected around the pool will cut down on evaporation, which can be accelerated by wind moving across the water’s surface. Shrubbery, fences, or boulders can serve double duty in both fighting evaporation and blocking debris. It’s estimated that somewhere around 30% of pools have leaks. Most of them are small and minor, but every drop that drips out is one that has to be replaced from the spigot. To check for leaks, simply make a grease pencil mark on the water level at the skimmer. If the level drops significantly in 24 hours, there is likely a leak. Leaks should be repaired by pool care professionals as soon as they are discovered. It may be an initial expense, but it will be worth it in the long run, both in water savings and for the life expectancy of the pool and lining. Admittedly, splashing is usually the result of friends and family having a good time in the pool. You can argue that fun and games are the whole point to pool ownership and therefore splashing is to be expected. However, the unnecessary or avoidable splash is worth preventing. First, any pool game in which the object is to splash water out of the pool should be avoided. Children invariably come up with games like this, so be on the lookout. When using fountains or waterfalls, be mindful of any excessive splash that they might cause, and turn them off when the pool isn’t in use. Finally, maintain a relatively low water level, low enough so that normal activity doesn’t consistently send water welling up over the sides to be wasted. The average two-minute backwash for a typical sand filter costs the pool owner about 200 gallons of water. That’s not to say you shouldn’t backwash, but the manner in which you backwash can be used to your advantage. First, never backwash for longer than necessary. The moment the water runs clear in the sight glass, stop. Also, decrease the frequency of backwashing by maintaining a clean pool and filter system. The more filth you force through the filter, the more frequently you’ll have to backwash. Conscientious maintenance is the key. If you follow the advice given here, you will save water in your swimming pool and, as a result save money, one drop at a time. These alternatives to chlorine can help you convert the chemicals into your pool into something that is less irritating for your swimmers.